Oceanlinx Wave Study | Sea Engineering, Inc.
Oceanlinx, an international renewable energy company has signed a MOU with the Maui Electric Company to provide 2.7MW of wave energy along the northern coast of Maui near Peahi. In order to develop understanding of the wave climate affecting their potential site, Oceanlinx contracted Sea Engineering to provide a three-monthy deployment of two ADCPs in 30m and 40m water depths respectively. 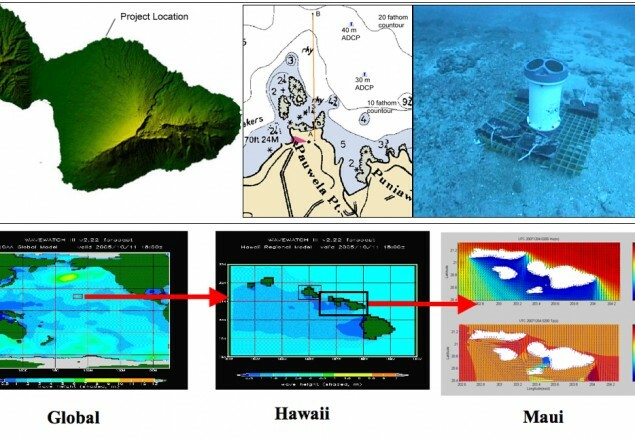 Additionally, Sea Engineering is providing a 10-year hindcast obtained from a nested spectral wave model setup that includes deep water WavewatchIII Global and Hawaii domains, and a nearshore SWAN model for the Maui domain. Data obtained from the ADCPs is used to provide validation of the numerical model hindcast results facilitating calibration of the hindcast data. Client: Ocean Power Technologies, Inc.